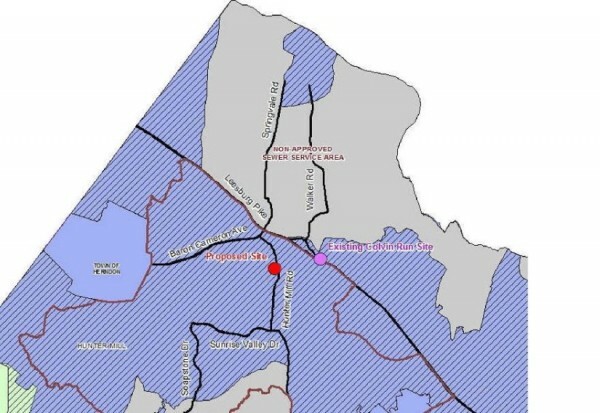 A Fairfax County septic tank disposal site may be relocating from Colvin Run Road road to land owned by the Fairfax County Park Authority in Reston. Fairfax County’s Department of Public Works and Environmental Services briefed park authority officials Wednesday on a Septage Receiving Site Feasibility Study that found several reasons to move the site to Reston. Septic tank customers (mainly homes on large lots not tied into the county sewer system), portable toilet companies and restaurants who must properly dispose of grease have for decades pumped waste safely into the Colvin Run plant. But that site is aging, prone to flooding and “stinks,” said Park Authority Chair Bill Bouie. About 22 trucks visit the site daily. The county is proposing a secure, modern, odor-controlled facility off Hunter Mill Road. It is important to have the new plant located off a major road to minimize the impact on traffic, county officials said. And while the proposed new site is on park land, it is not in a part of Lake Fairfax Park where citizens would be using the park, said Bouie. The Park Authority’s Area 6 Park Operations / Lake Fairfax Maintenance area is located in an isolated, employee-only part of the park. The septage facility would be heavily screened by trees and is not in a floodplain, according to the county’s proposal. Adding the septage facility would also be a chance to make needed improvements to the current site, which currently is a tree debris and solid waste disposal area, as well as mulch storage. The new location would also provide convenient access from areas without sewer service (i.e., Great Falls and Oakton), as well as Reston and Vienna restaurants, the presentation noted. Bouie said most trips to the plant would be grease disposal as home septic customers usually only get cleanouts about once every five years. Residents can learn more and offer feedback at a community meeting with Hunter Mill Supervisor Cathy Hudgins Feb. 18 at 7:30 p.m., at Bechtel Conference Center, 1801 Alexander Bell Drive, Reston.